Front row: Pupil Evie Ford (centre) with Enid Brown (left) and Laura Sneath (right). Back row: Pupils Tom Rhodes (left) and Jake Bowers (right) with Cabinet Member for Adult Social Care, Cllr David Roche. As part of our VbE we have made links with Davies Court Care Home. Julie Francos our pastoral lead visits Davies Court every week with pupils from each year group, where the children spend time with the residents, chatting and playing games. OLDER people with dementia have begun to share their life stories and memories with children in an innovative new project. The Adopt a Care Home scheme links schools and care homes to raise awareness of dementia, increase understanding and help to create a “dementia friendly generation”. 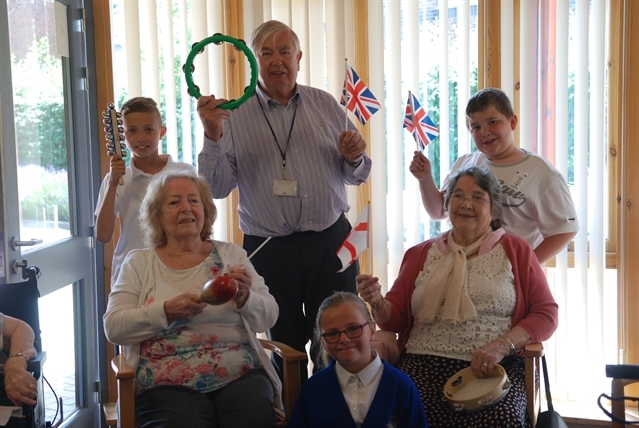 Pupils from Dinnington Primary School took part in weekly visits to Davies Court Care Home during the summer term to speak to residents receiving long stay residential dementia care. As part of the project, pupils will develop a memory book that documents their own and the residents' favourite holidays, foods and sweets, hobbies, and life at school, and they then explore the differences together. Children of mixed age groups, including some from the nursery, also visited the home to play games with the residents, do “movement to music” and read stories. Cllr David Roche, Rotherham Borough Council’s cabinet member for public health, said: “We wanted to get involved in the Adopt a Care Home project as there are a number of studies that suggest the scheme can have great benefits for people with dementia. “It’s remarkable to see the effect that spending just a couple of hours each week has on the residents. “All the residents have really enjoyed reminiscing and working with the children to create their memory books. “This pilot project has been a great success for everyone involved, and I’d encourage more schools and care homes to partner up and realise the benefits for themselves. “The children we are working with will of course be the next generation of carers so we really want to get across what the symptoms of dementia are, how the disease can change people and what it's like to care for someone who is struggling with their memory. Vanessa Vaughan, head teacher at Dinnington Primary School, said: “This scheme is unique, as it delivers benefits to children and people with dementia at the same time. “We feel that it’s such a positive approach which helps bridge the gap between the young and older generations and also shows that by working closely together we can raise awareness about degenerative diseases such as dementia, as well as breaking down barriers caused by a lack of understanding.